Culture Grams is a great site to use when doing research on countries and states. You can search by the country name or by continent. With a World Edition, Kids Edition, States Edition and Provinces Edition Culture Grams has the latest and greatest information in easily readable formats. Recommendations - start off with the Kids Edition. Added bonus - There is a feature on the bottom of the kid's edition pages to hear the countries anthem song! 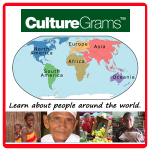 Click on the Culture Grams icon above to use this site.